Readers, what I'd MOST like to be presenting today is a cartoon about last night's debate between Joe Biden and Paul Ryan. Unfortunately, in order to get the cartoon and commentary plugged into the towering Hope n' Change virtual printing presses by deadline, I'm writing this hours before the beatdown - er, I mean debate - has taken place. But that's okay too, because there's a pretty hot topic unrelated to the debate that I really wanted to talk about. And that's the fact that Barack Hussein Obama is a despicable liar. He's lying through his teeth about the terrorist attack on Benghazi - as are Hillary Clinton, Susan Rice, Jay Carney and others. The more evidence which comes in, the clearer it is that Obama threw our dead under a bus - specifically his campaign bus - to cover up for the disastrous policy decisions that left our Ambassador defenseless in a dangerous part of the world on 9/11...a day which Barack Obama didn't consider "sensitive" enough that any increased security was called for. Obama was blatantly lying during the debate about Romney wanting to cut taxes by $5 trillion for the wealthy. And if you follow that link, you'll find out that Obama was lying (not misstating, not misunderstanding, not spinning, but LYING) about almost everything else he said about Romney that night. Speaking of lying, why would Barack Obama invoke executive privilege to hide internal information about the "Fast & Furious" bloodbaths in Mexico while simultaneously claiming that there's nothing to hide?! 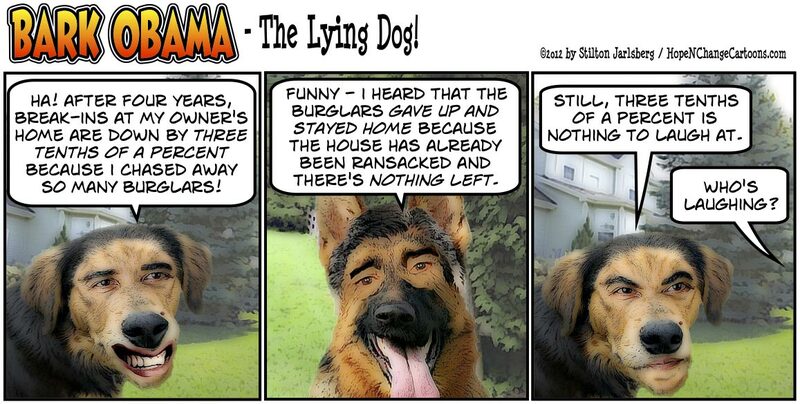 And Barry's tendency to lie is nothing new. Recently, a video from 2007 turned up in which "Ghetto-speak Barry" is railing to a black audience that the racist government wouldn't give New Orleans the same support as other disaster-stricken cities because it was largely black. Specifically, he said Congress wouldn't waive the "Stafford Act," which would require New Orleans to come up with seed money to get other benefits. But he was lying - big time. Two weeks before Barry made his race-baiting speech, Congress had waived the Stafford Act and in fact, allocated more money to New Orleans than any other stricken city. And Barry - who was an Illinois Senator at the time - was one of the very few in the Senate to vote against giving New Orleans the money. In other words, he was lying to his black audience for the same reason he tried to deny them aid: because his own political future was best served by angry black audiences - even if their anger was unknowingly provoked by this dreadful, truthless little political worm. I think it's safe to assume that Barack Hussein Obama is much like an iceberg: and that as horrendous as all of his combined lies are, they probably represent only 10% of the anti-American lies he's telling in places we can't hear (except when a microphone is accidentally left on). Barack Obama is a filthy, reprehensible liar whose presence in the Whitehouse is a stain. He is a moral cancer, aggressively metastasizing. He is a blight, a curse, and quite possibly a Biblical plague. We have GOT to vote him out of office - AND vote in conservatives for all the "down ballot" positions in order to empower Romney and Ryan to start cleaning up Washington. On Monday morning, Mitt Romney appeared before the assembled men and women of the Virginia Military Institute, and gave a foreign policy speech which made it very, very clear that if he is elected, there's going to be a new sheriff in town. One who is strong militarily, and is entirely clear about supporting our allies and causing our enemies to have sleepless nights. It's the strongest, most logical, most pro-American, and most Presidential foreign policy speech we've heard in four years...and we can only imagine that when Barack Obama heard this speech and thought about his upcoming foreign policy debate, he responsed immediately and forcefully: explosively filling his adult diapers like a shrieking, diarrhea-stricken infant after a 3-day strained prune bender. Although the liberal MSM is saying that Romney's speech was "vague" and "lacked details" (keep in mind, these are the same people who thought "Yes We Can" was the most detailed set of policy blueprints since God layed out the Universe) we thought Mitt was extremely thorough within the confines of a 22-minute speech. He was able to single out the president's failures in Syria, Yemen, and Somalia. Criticize Mr. Obama for failing to even voice support for the people's uprising in Iran, while simultaneously doing nothing substantive to prevent Iran ("A tiny country that poses no serious threat," according to Barry in 2008) from obtaining nuclear weapons to obliterate our ally Israel. Or make that former-ally, since Romney concedes damage repair will be needed after Obama's policy of "creating daylight" between the U.S. and Israel. Mitt Romney looked at the disastrous situation in Libya, and the murder of our ambassador and three other Americans in Benghazi. A terrorist attack which the president's team lied about for over a week, and about which there are still serious questions regarding why they pulled the Ambassador's security team after he asked for more, not less, security. Mitt didn't forget the rest of Obama's botched foreign policies either, like caving to Russia whenever possible (and promising "more flexibility" after the election), reducing our missile protection of allies in Europe, and failing to stay strong in the face of pressures - military and economic - from China. Nor did he spare Mr. Obama from the harsh reality that the president's policies are throwing away our military gains in Afghanistan solely for the president's political benefit. Note to MSM - tell us again, please, about how this speech lacked specifics? Here at Hope n' Change, we expected to like the speech - but were somewhat surprised to love it. And to be reawakened to the sound of a possible President who speaks like a grown-up and an American, discussing goals and ideals but doing so with a specificity that Barack Obama wouldn't dream of (and which his father clearly didn't dream about). We've embedded the full 22 minute speech below, and strongly encourage you to watch it (or, you can read the full transcript here). You can even enhance your pleasure by imagining the Tourette's-like screams of agony which must have been occuring while Obama's debate prep team were watching this and imagining Barry "Choom Gang" Soetoro facing these accusations on live television while Mitt demands answers. There was a time when all Hope n' Change wanted was Obama out of the Whitehouse. Happily, we now also want Mitt Romney in the Whitehouse. Watch, and see if you don't agree. Yes, this is the Change we've been Hoping for. Silly Bonus: I couldn't help but have a little fun with the "Big Bird" story, so created this video. Following Barack Obama's humiliating defeat on the debate stage, the Democrats are looking to Joe Biden to deliver a big win against Paul Ryan this Thursday. Which may be, as far as Hope n' Change can tell, the first real evidence that Democrats believe in the power of prayer. To prepare for the debate, Joe Biden is taking six days off from his grueling campaign schedule. Which doesn't necessarily mean he'll be studying all that time...it just means that when the debate starts, it will have been at least six days since his last major public gaffe. Among some of the more delicious whoppers of late, Biden recently announced that "the middle class has been buried for the last four years," apparently (and believably) unaware of who's been running things for the last four years. He then proclaimed that "Republicans say Obama and Biden want to raise taxes by a trillion dollars. Guess what? Yes, we do!" Yeah, that will certainly get businesses to start hiring! 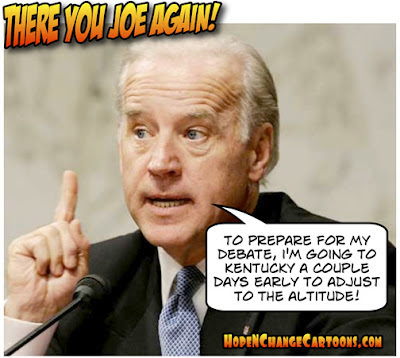 But in all seriousness, Hope n' Change thinks it entirely possible that Biden may have some sort of nasty surprise up his sleeve when he steps onto the debate stage this Thursday. The Obama campaign desperately needs to hit Romney hard, and Barack Obama can't be seen "lowering himself" by making some scurrilous personal attack on his opponent. But Biden can, and possibly will. Not that we think there's any actual dirt on either Mitt Romney or Paul Ryan - but we fully believe that lying is the very essence of "The Chicago Way" and Joe Biden is nothing if not a willing political tool. Moreover, Biden is a much better debater than his boss - perhaps because he isn't distracted by actually thinking while he speaks, and is happy to enthusiastically spout whatever nonsense feels right at the moment - like suggesting to black folks that Romney wants to put them "back in chains." Because really, what goes over better with a black audience than slavery jokes? Like the man and the boxing kangaroo, Ryan and Biden are going to be two wildly different opponents with completely different styles. Things may get ugly and may get crazy - but they definitely won't be boring.